The festivities kicked-off with a Christmas decorating party held by the employees of BBVA Compass, US Bank and Wells Fargo at all four KidWorks centers. This tradition started several years ago when our friends and corporate partner, US Bank started decorating the KidWorks centers and this year BBVA Compass and Wells Fargo lent their help to the festivities. When our students returned to KidWorks after Thanksgiving Break they were greeted with Christmas cheer. The celebrating doesn't stop there, now that December is in full swing there are a myriad of activities taking place at KidWorks this month. We welcome members of the community to participate in all that's happening this season. 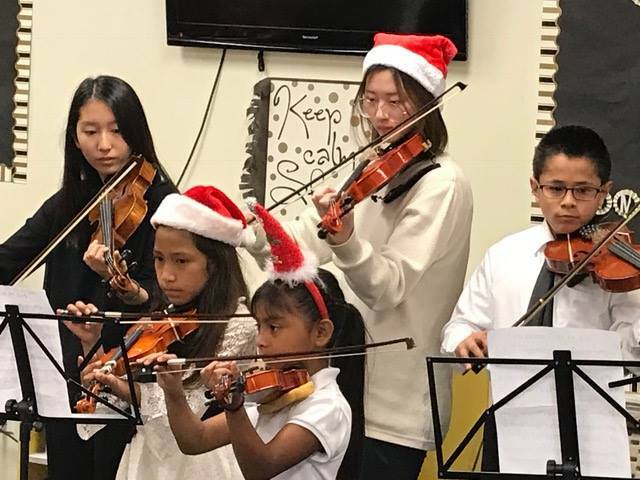 The KidWorks beginning and intermediate students enrolled in our Love in Music program perform holiday favorites in their annual recital. All events take place at KidWorks. Celebrate the Christmas Season at our Las Posadas Christmas Celebration. Greet KidWorks students and families as they arrive from the Townsend Street processional, enjoy Christmas treats, sing carols, play games, meet KidWorks students and celebrate the start of Christmas with your KidWorks family. For many of the central Santa Ana families KidWorks serves, being able to purchase Christmas gifts is not always financially possible. Their limited funds go to rent and groceries. That’s why the KidWorks Christmas store has been such a blessing for hundreds of families for 15 years. This year, the store will be open to serve families on Wednesday, Dec. 13 from 8 a.m. to noon and on Tuesday, Dec. 19th from 8 a.m. to noon and from 3 p.m. to 7 p.m.
1) Donate Gifts & Gift Cards: Please bring your new, unwrapped items to KidWorks no later than Dec. 14. 2) Volunteer at the KidWorks Christmas store: Help wrap gifts for the parents, and assist those needing help loading gifts into their vehicle or cart. Interested in knowing more? Please contact the KidWorks’ volunteer department at: 714-834-9400, extension 115. Your help will help continue our 15-year tradition of creating holiday smiles! Dreams really do come true. The “Building Dreams” initiative launched in mid-2015 to fully renovate and expand our Dan Donahue Center becomes a reality next month when we celebrate the Grand Re-opening and Dedication on September 13th. An additional 10,000 square footage will be added to our site and allow 200 new students to join the KidWorks family over the coming year. This expansion wouldn't happen without the generosity of our partners who have walked alongside us to develop our capacity to serve more children and youth in Santa Ana. “By doubling the size of the Donahue Center, we will be able to welcome hundreds more children, youth and families into our programs,” says David Benavides, Executive Director. Our fall programs launch on September 5th. KidWorks has also already begun accepting applications for additional students to join our academic, leadership and spiritual development programs, and they will fold into the KidWorks Donahue Center activities over the next few months to facilitate a seamless transition. If you happen to be a fourth grader, you’re probably very astute when it comes to evaluating field trips. So it’s definitely a ringing endorsement when our young students give such high marks to their recent complimentary visit to the Orange County Fair. “This was the best field trip I’ve ever been on!” says Zuleima. In late July, 200 of our students in kindergarten through fifth grade spent the day at the fair, joined by staff and 22 volunteers, including several of our older students. Several of the older students served as a buddy to a younger students during the day. For some of the kids, this was their first time going to a fair or amusement park so this outing was a special treat. The students also got to pet farm animals, dance to music, visit Centennial Farm, and learn through exhibits including a salute to the military at the Veterans. These and other similar experiences are some of the special features provided by our summer programs with support from our community partners. Rachel says the kids’ day was packed with fun from start to finish. “They rode a roller coaster and sky lift, won plush toys and cooled down in a water fountain--all while keeping their energy level up with pizza, and ice cream!” she says. KidWorks extends a big “thank you!” to the Orange County Fair for making the day so special for our students. KidWorks celebrates the kick-off of construction with Christmas treats! US Bank brings the Christmas cheer to KidWorks! Each year US Bank visits our Dan Donahue Center to decorate for the coming holiday season. This simple act of kindness blesses our staff and families in ways words cannot express. The students are thrilled to see the center in full Christmas decor when they return from Thanksgiving break. We are so grateful for our friends at US Bank and we appreciate their generosity each holiday season. On November 17, 2016, we celebrating our 10th Anniversary of the Foundation for Success Luncheon at the Doubletree Hotel in Santa Ana, California. Celebrating 10 years of success looked like all of our friends joining us for an afternoon of good food, good laughs, and a speech by the incredible NFL legend Jackie Slater. If you joined us, we are so grateful for your support! If you were unable to join, we are still so deeply appreciative of your partnership and hope to see you next year! We're just a few weeks away from the 10 Year Anniversary of our annual Foundation for Success Luncheon--and it promises to be the best yet. Thanks so much to all of our generous sponsors and supporters for making this event so great each year. There's still time to secure a sponsorship for your company, foundation or organization. Click Here for more details! We looking forward to seeing everyone on Thursday, November 17th at 11:30 at the Double Tree Hotel in Santa Ana! Editor’s note: We are pleased to present the fourth story in our latest blog series, “Foundation for Success: 10 Year Anniversary Celebration.” In this installment, we describe how the dollars raised go such a long way to support the after-school programs at our Dan Donahue Center. Each school week, hundreds of students stream into our Dan Donahue Center to grow academically, learn about the arts, develop spiritually and maybe even toss a basketball around for a few minutes. Each of these experiences—and more—in some measure or another are funded by the Foundation for Success luncheon, our premier event of the year. Over 10 years, $4.3 million (net) has been raised at our Foundation for Success luncheons. Each dollar has had a tremendous impact on the lives of each of our students. For example, for the past two years 100% of KidWorks students graduated high school on time and continued on to colleges and universities (a much higher percentage than in Santa Ana schools overall). The majority of the luncheon’s costs are underwritten or covered by sponsors, meaning that almost every dollar raised goes towards helping the over 800 children, youth and families we serve. As the 2016 luncheon nears, we invite everyone to be part of one of Orange County’s most anticipated non-profit events—one that for the past three years, the Orange County Business Journal has listed as one of the top five fundraising luncheons. This powerful message was brought to life this summer for our kindergarten through fifth grade students by Calvary Chapel’s Iglesia La Puerta Church. Pastor Armando Reyes and 15 Iglesia La Puerta church members—including youth and adults—led the vacation bible study that took place the final week of our summer program. The church also hosted a fun day for neighborhood families on the Sunday following the conclusion of our summer program. Noemi said that the students learned that treasurers are not just material items, but more importantly the people, faith and values that they hold dear in their hearts. Noemi also thanked Teen Challenge for leading a similar bible study activity at our Bishop Manor satellite center and the Christ Before You Ministry organization for a fun beach day they hosted for students attending summer programs at our Cedar Evergreen Center. Townsend Street Fair was a Huge Success! On Saturday, August 20, 2016 we hosted our largest community event of the year, The Townsend Street Fair. The theme for this year’s fair was Neighborhoods of Action and Hope. Our goal was to increase awareness and access to health related services to strengthen the local community, celebrate its positive attributes, and bring different resources from the community to Central Santa Ana. Over 50 organizations and businesses attended, all of which brought fun activities for youth and children. Participating organizations included: PBS SoCal, Santa Ana College, Orange County Health Care Agency, Coalition of Orange County Community Health Centers and Community Health Initiative of Orange County, which offered free information and guidance on free and low-cost community services and educational and college opportunities. Questions on getting involved for next year's Townsend Street Fair? Contact Frank Bejarano, Frank.Bejarano@kidworksoc.org for more information.